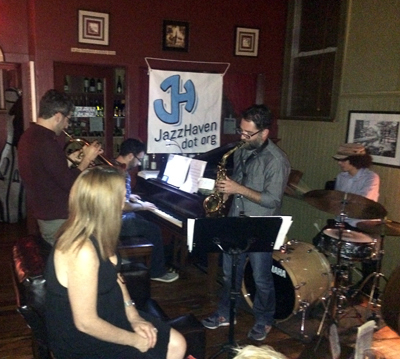 Jazz Week performances take place in New Haven’s restaurants, bars, and clubs. For the past three years Jazz Haven has produced a full week of jazz throughout New Haven during the period of the Jazz Festival in August. Jazz musicians perform in restaurants, bars, clubs, pubs and other venues throughout the City. The attendance and response from the public has been overwhelming. At left, the Elligers Brothers at Cave A Vin Wine Bar during Jazz Week. The Owl Shop, Cave A Vin Wine Bar, Delaney’s, 116 Crown, Kelly’s GastroPub, Geronimo, Cafe Nine, Ordinary, Briq, ROIA, Zafra’s, Toad’s Place, Sage Grill, the 9th Note, Project Storefront, Palmiera Brazil, Rudy’s, Stella Blues, Lucky Chao, Stone Hearth, Temple Grill, Olde School, Firehouse 12, The Study at Yale and more. Giacomo Gates, Kris Jensen, Glenn Roth, Brian Butler, Joe Cutrone, Ben Wolfe, Stacy Dilliard, Matt Oestreicher, Elligers Brothers, Monk Family & friends, Mimosa Steel Pan, Nick DiMaria, Jeff Fuller, Gil Hawkins, Jr., Josh Bruneau, Gary Grippo, Tony Lombardozzi, Dave Livolsi, Mike Coppola, Jake Epstein, Billy Cofrances, Herb Wilson, Harold Zinno, Morris Trent, Matt Dwonszyk, Rohn Lawrence, Rudyna Babouder, Z3, Verve Jazz Ensemble, Chris DeAngelis, Adrian Tramontano, Rex Cadwallader, George Lesiw, George Baker, Rick Reyes, Steve Davis, Nick Biello, Karl Testa, Tim Palmieri, Neddy Smith Trio, Crown Street Orchestra, Hawkins Jazz Collective, New Unity Quartet, Donald Edwards, and so many more.